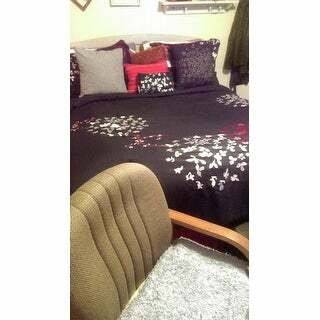 Love the comforter. It looks exactly how it’s pictured above. It’s not to heavy and not to thin. 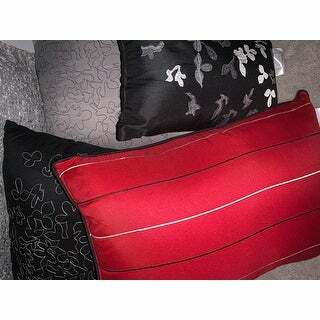 The colors pop and go perfectly in my red, black and grey bedroom. I would recommend! Add a bold accent to your bedroom with the Scaevola Comforter Set from Oliver & James. 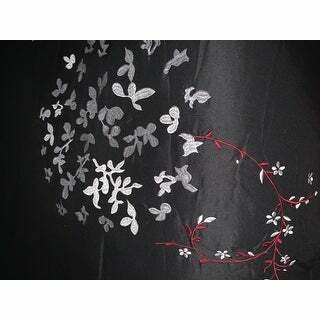 The black set features a floral pattern in shades of white and red that is accented by the white microfiber sheets. The plush comforter is filled with soft polyester to keep you warm on brisk, winter nights. The Oliver & James Caro Black 8-piece Comforter Set is beautiful. This is a beautiful set, looks just like the picture. Comes with a lot of pillows to decorate the bed. Doesn’t wash that well and seems to hold long even after being in the dryer. The title says it all. This thing is nice! It ordered Queen and it fits my bed perfect. 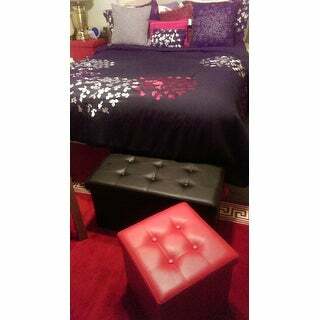 The bedskirt is nice quality and I love the way the look transformed my room. It is however not stain resistant or forgiving. I see already that if I wash it, the color will fade and it will likely lump up on me, though I hope not. Had to do a spot clean, with only water, and I can see the spot bk the black faded a little. Also, not at all forgiving of pet hair. My poor cat has lost his place in the sun now, bk I can no longer allow him to lay around on this: he sheds so much! But otherwise, it's a very nice piece. Quality is to be determined, even though it LOOKS high quality, not sure how it will hold up to normal wear and use. I love this comforter. The detail for the flowers is nice and and the colors match perfectly with my room. The comforter is thick but not to bulky. Great comforter. I was hesitant at first to order online. The pictures and written description were perfectly accurate. This is a beautiful set with real embroidery . The pillows are a nice addition. I have received many compliments on this set. I got this set for my daughters room , she picked it out and loves it, very well made set, the pillows that came with it are very nice also, this is just what my daughter had in mind for her room. I’ve been searching for an oversized comforter and was a bit sceptical about this purchase but when I received it, it was better than I expected. The size was on point and it’s made of quality materials. Beautiful colors! Comforter is very soft. Great buy for being a blind purchase. Only reason I didn't rate it 5 stars is because one of the pillow's stitching was already undone when I opened the box. This comforter is beautiful. Colors are vibrant. Not real heavy but not thin either. Thinner, but warmer than expected. Great value for a beautiful set! This comforter set is just as beautiful in person as it is in the picture (if not more). The only reason I didn't give it 5 stars is that is took close to 2 weeks for me to receive it.